Having bought the Samson Go Mic I realised that I had nowhere to position in on my desk, especially with the monitors being wider than the in-built clamp, soolution found was rthe Andoer MS-12 Mini Foldable Mic Desk Stand. There is not a lot to say about it other than it does what it is supposed to do, comes in at under £6 with Amazon ( http://www.amazon.co.uk/dp/B013U48ZZ4 ) although you can find it a little cheaper elsewhere (and I got mine with a Mic Clip as well still for less) and if nothing else makes a great fixing for a pop filter! Foldable design for ease of carrying and storing. 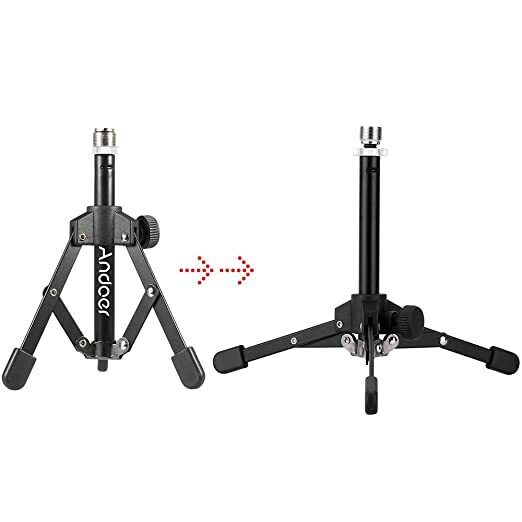 Tripod design to give it exceptional strength. Non-slip rubber feet to protect your desk from scratches. With a clutch to help you lock the stand, more stable. Made of high quality iron, durable and sturdy. Suitable for meetings, lectures, speaking and ect.